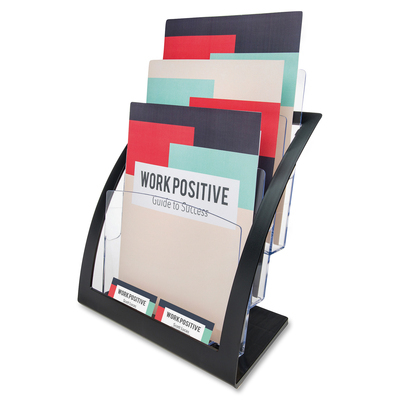 A contemporary design literature holder for more upscale décor. Three separate compartments hold up to 1" of material each with additional space for business cards. Clear front pockets allow for easy viewing of literature. Ideal for tradeshows, reception areas and waiting rooms. Plastic frame has the appearance of metal. A contemporary design for more upscale décor. Sturdy plastic construction with the look of metal. Three separate compartments hold up to 1" of material each with additional space for business cards. Ideal for tradeshows, reception areas and waiting rooms.